I am a creature of habit. I tend to wear the same beauty products over and over again. Very rarely do I stray from my favorites, but every once in a while it is fun to try something. This is wear I find myself. I parted ways with a few of my beauty favorites this month (Bobbi Brown Perfectly Defined Gel Eyeliner, Laura Mercier Secret Concealer, Essie Chinchilly Nailpolish, and First Aid Beauty Face Cleanser) in order to try something new. After a hectic move, three weeks in Spain, and a dramatic change in climate my beauty routine needed a refresh. 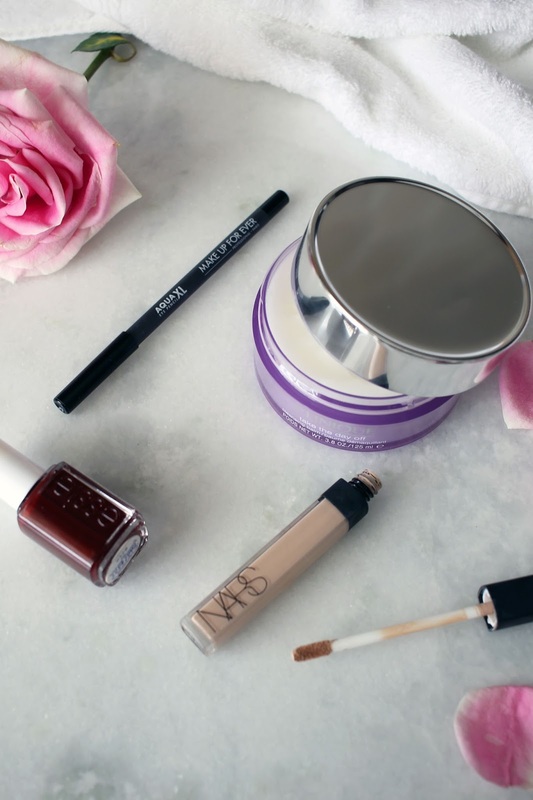 I scoured the web to find the latest and greatest products, and the above four items are the ones I plan on adding to my routine. See below for a little more info about each. Clinique Take The Day Off Cleansing Balm I've read a lot about the benefits of using a beauty balm in place of a cleanser during the evening. It is easier on the skin, more moisturizing, and fabulous at taking off makeup. While cleansing with an oil-based product may seem counterintuitive this product leaves my skin softer than any cleanser I have ever used. While I am not sure I will use it during the summer it is the perfect product to use as the air become drier and cooler to add a little more moisture to your skin. Makeup Forever Aqua XL Waterproof Eye Pencil My eyelids are naturally oily so finding eye makeup that stays put throughout the day is a challenge. Most days I only wear mascara in order to avoid the dreaded raccoon eyes, but this waterproof eyeliner did a great job at staying put. I smudge a little on my upper eyelid and my bottom eyelid for a more dramatic look knowing it will stay put. NARS Radient Creamy Concealer If I had to choose a desert island product this concealer would be a top contender. It is lightweight, stays put, and does not give into any creases. It is amazing how well this concealer works. I also love how lightweight it is. You do not end up feeling like you are wearing a mask or that your makeup looks caked on. Essie Bold and Beautiful Nailpolish After five months of wearing the same grey polish on my toenails I knew it was time to give a new shad a try. This is actually a color from an old winter collection that I snagged on sale, but I love the dark bordeaux color. It is dark enough that you still get a dramatic effect for fall without it looking overdone.